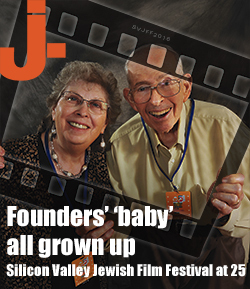 Founders' 'baby' all grown up: Silicon Valley Jewish Film Festival at 25 – J. A quarter-century after it launched with advice from a rabbi’s daughter and a hefty supply of free bagels, the Silicon Valley Jewish Film Festival has evolved into a top South Bay cultural event. The annual festival — which opens Thursday, Oct. 27, and runs through Nov. 20 — has grown from just four films screened in a local theater into 27 films shown over three weeks, with offerings from seven countries and in-person appearances from international directors and celebrities, including this year’s literary star, Israeli writer and peace activist Amos Oz. It has expanded from an all-volunteer shoestring operation to a professionally run cultural event that boasts more than two dozen corporate sponsors, ranging from the Oakland A’s to Sinai Memorial Chapel to Oren’s Hummus Shop; J. is also a sponsor. Eighty-three individual donors each contributed $1,000 or more this year. But amid all these changes, one constant remains: Festival creators Burt Epstein, 87, and Fagie Rosen, 76, will be on hand for many of the shows, passing out tickets at will call and greeting audience members in person, as they have done each year since 1992 — as volunteers, just the way they started. For longtime audience members, seeing Epstein and Rosen at the front door is part of the show. Judy Applesmith knew almost no one in the Bay Area when she moved from Detroit in 1990 and said the film festival became a big part of her social life when it launched two years later. She would see films with friends from her havurah group at Congregation Beth David in Saratoga, and sometimes stopped by on her own on her way home from her job as a Santa Clara County social worker. She still goes to about 10 of the festival films each year, she says, and doesn’t mind going by herself because she sees so many familiar faces among the attendees and volunteers. Epstein, who in 1978 helped co-found Jewish Family Services of Silicon Valley, had attended a few screenings at the San Francisco Jewish Film Festival after its launch in 1980 as the world’s first Jewish film festival. He was happy to make the drive north, but, he wondered, did he really have to? “It occurred to me, wouldn’t it be neat to bring these films down to San Jose?” Epstein, who then worked in the Silicon Valley for General Electric, said in an interview. His first move was to reach out to Janis Plotkin, then the San Francisco festival’s co-director. Coincidentally, her father was the rabbi of the synagogue that the Epsteins had attended in Phoenix before they moved to San Jose. Plotkin referred him to a book published by the San Francisco festival, “Independent Jewish Film, A Resource Guide,” that she said had become a main resource for Jewish film festivals in other cities including New York, Boston, Seattle and Washington, D.C.
At about the same time that Epstein was hatching his plan, Rosen — who was director of senior services at the Addison-Penzak JCC in Los Gatos — was coming up with her own notion of a Jewish film festival for the South Bay. 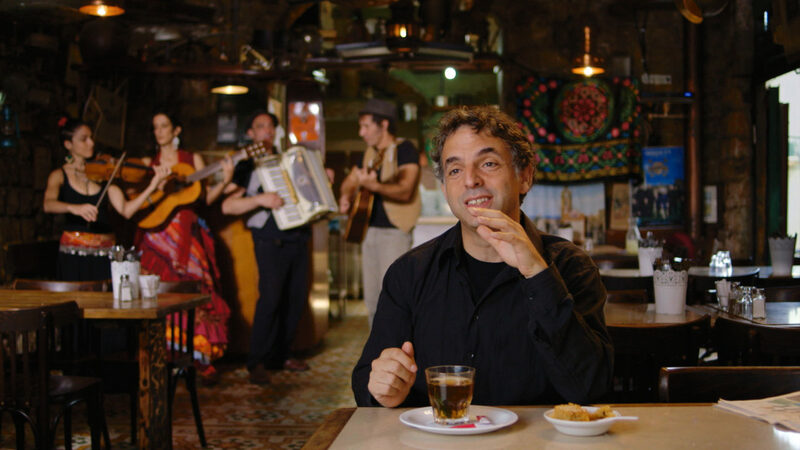 Israeli comedy screens on Nov. 6. “My father was a projectionist in Canada, movies were part of our family,” she told J.
Epstein and Rosen, who both attended Temple Emanu-El in San Jose and met when Epstein worked as a volunteer for senior programs at the JCC, decided to join forces — along with Bernis Kretchmar, the S.F.-based Jewish Community Federation’s Women’s Division director based on the South Peninsula. In 1991, they placed an ad in the Federation’s bulletin and met with about a dozen other interested volunteers at the Los Gatos JCC. Calling their nascent operation the San Jose Jewish Film Series, they contacted film distributors, screened a few movies and set up their first festival in October 1992 — four movies, one each weekend for four weeks, at the Towne Theatre in San Jose. Patrons could see all four movies for $25 (or $18 for seniors). It was a very ad-hoc organization, to say the least. Discussions among group members often ended in arguments about which films to choose. The very first screening by the festival was “The Quarrel,” a 1991 Canadian film in which two Holocaust survivors — a rabbi and an agnostic writer — meet later in life in Montreal to debate about the beliefs that divided them as boys. “The Last Laugh” closes the festival. Opening night was a sellout. Epstein was the group’s first chairman, and Rosen and Epstein’s wife, Sandy, ran the box office while other volunteers handled similar chores. As audience members left screenings that first year, the Epsteins and Rosen handed out bagels donated to the festival by Noah’s Bagels, “as a thank you for coming,” according to Rosen. One of the reasons for the inaugural festival’s success, Burt Epstein surmises, is that many patrons were happy to avoid the drive to San Francisco for the big Jewish film festival. Another reason to stay local, he added, was the slightly different tone of the San Jose festival, exemplified by the different film choices made by the organizers. As the film series has evolved, including its rebranding first as the San Jose Jewish Film Festival and then in 2008 as the Silicon Valley Jewish Film Festival, it also has shifted its focus to reflect the tens of thousands of Israeli expats living in Silicon Valley, many of them drawn by jobs in the high-tech industry. Tzvia Shelef, who became the festival’s executive director in 2011 after working in Israel and the U.S. as a television and movie producer, says her organization has received tremendous support from its counterpart in San Francisco, but notes that the South Bay demographic dictates its more concerted focus on Israeli films. 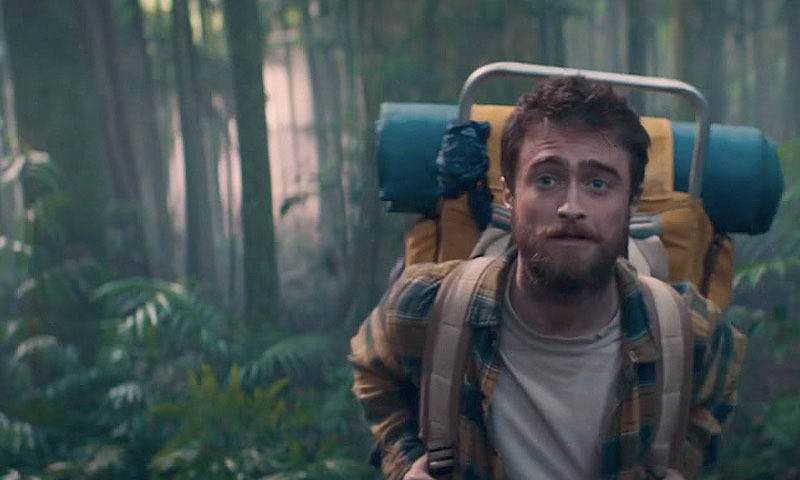 Twelve of the 27 films (44 percent) in this year’s Silicon Valley Jewish Film Festival hail from Israel, versus 25 of the 67 films (37 percent) that screened in the San Francisco Jewish Film Festival. The San Francisco festival has a greater international focus, boasting films this summer from 15 countries. The Silicon Valley films will be shown at the AMC Saratoga 14 in San Jose and the Oshman Family JCC in Palo Alto. About half will be shown at both locations. Movies from Germany, France, Hungary, Ethiopia and Morocco will supplement those from the U.S. and, of course, Israel. Sandy Epstein, 87, who has been married to Burt for 66 years, said another advantage of Israeli films (and other international movies) is that they have English subtitles — a big help for seniors who have trouble hearing the dialogue. The centerpiece event on Nov. 12 at the JCC will feature 90-year-old Berkeley violinist Stuart Canin reprising the five works he performed as a 19-year-old in 1945 for Harry Truman, Winston Churchill and Josef Stalin at the famed Potsdam conference. His performance will come after the screening of a 15-minute documentary, “The Rifleman’s Violin,” about that Potsdam performance where the teenage Canin played for the three world leaders as they discussed the future of post-World War II Europe. 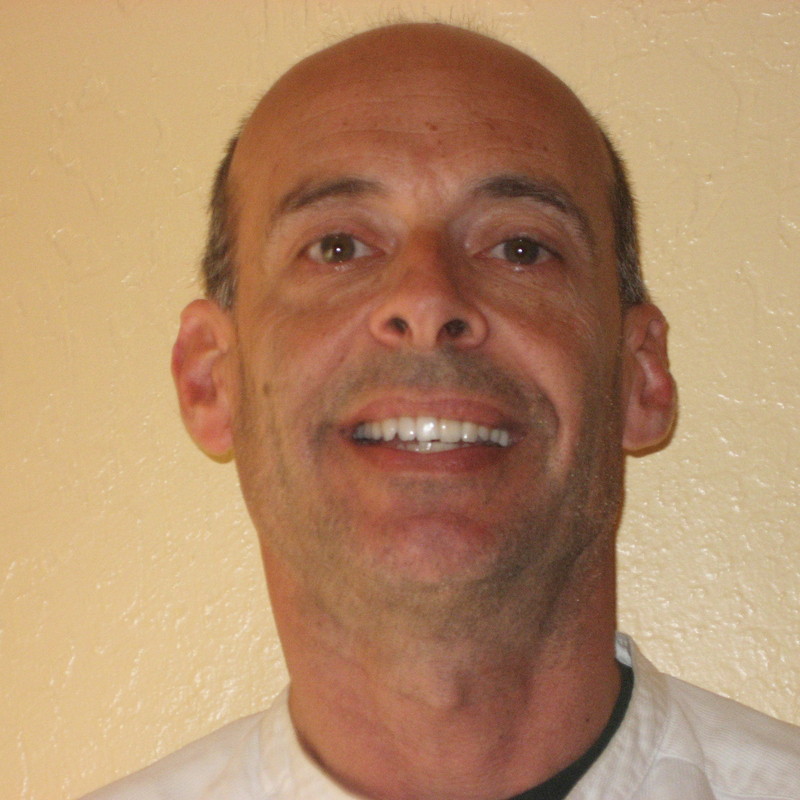 The film was made by documentarian Sam Ball of the S.F.-based nonprofit Citizen Film. Ball and Canin will engage in a discussion facilitated by Hoover Institution senior fellow Norman Naimark immediately after Canin’s performance. A reception will follow. The festival’s opening night will be devoted, appropriately enough, to the evolution of the Israeli film industry from the 1960s to today, with a special screening of “Celebration: The Story of Israeli Cinema.” Producer Arik Bernstein and actor Mike Burstyn will lead a discussion after the film. And the festival’s closing-night film will be “The Last Laugh,” which examines what is appropriate in comedy and whether subjects such as the Holocaust should be off-limits as targets for humor. From opening to closing, the Epsteins and Rosen will be a nearly constant presence as the festival marks its quarter-century. Silicon Valley Jewish Film Festival, Oct. 27-Nov. 20 at Oshman Family JCC in Palo Alto and AMC Saratoga 14 in San Jose.